In order to make getting the Big Island more easy we have split the Island of Hawaii into four zones. Each of these regions has its own highlights and unique atmosphere so please consider spending a few nights of your itinerary in each of them if you spend enough time here. 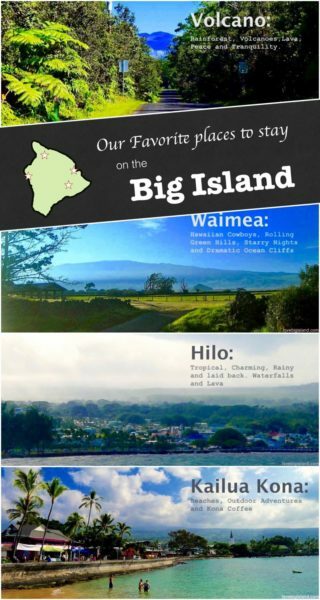 The four best places to use as home base for your Big Island adventures are: Hilo (the capital), Kailua Kona (outdoors! ), Waimea (beaches and valleys) and Volcano Village (Jungle and volcanoes). Hilo is the capital of the Big Island and lies on the rainy windward (East) side of the Island. The city is not your typical tourist town but very easy to fall in love with. Hilo is rainy and charming, tropical and laid back. People here are friendly, and time here seems run just a bit slower than on the Kona side of the island. This is our favorite city on the Big Island! Read more in our Hilo area guide. The weather in Kona is almost always warm with an occasional afternoon shower. It is close to picture-perfect white sand beaches towards the north and to the lush and tropical south-Kona coast with great snorkeling and delicious Kona Coffee. Kona is the closest you’ll come to nightlife on the Big Island with a small but varied offering of restaurants, bars and two great brewpubs. Read more in our Kailua Kona area guide. Volcano Village is a small village right next to the impressive Hawaii Volcanoes National Park. It is hidden at 4000 ft altitude in a dense rainforest that makes you feel like you are in Jurassic park. Volcano is a place to relax. 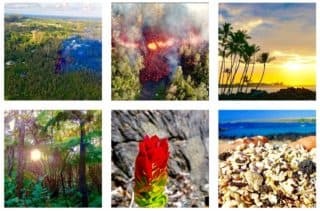 Far away from the traffic, the crowds, and even the streetlights, Volcano is our favorite place on the Big Island to spend a few night to explore the Hawaii Volcanoes national Park and the Puna region. Read more in our Volcano Village area guide. Waimea lies on the oldest of 5 volcanoes that make up the Big Island: Kohala. At 2676 ft (816 meters) elevation the nights are cool and the skies dark and clear! Waimea with its rolling green hills is home to the Hawaiian Cowboys (the Paniolo) and has great access to the spectacular Waipi’o valley and Pololu Valley, and is close to some of the prettiest white sand beaches on the Big Island. Read more in our Waimea area guide. 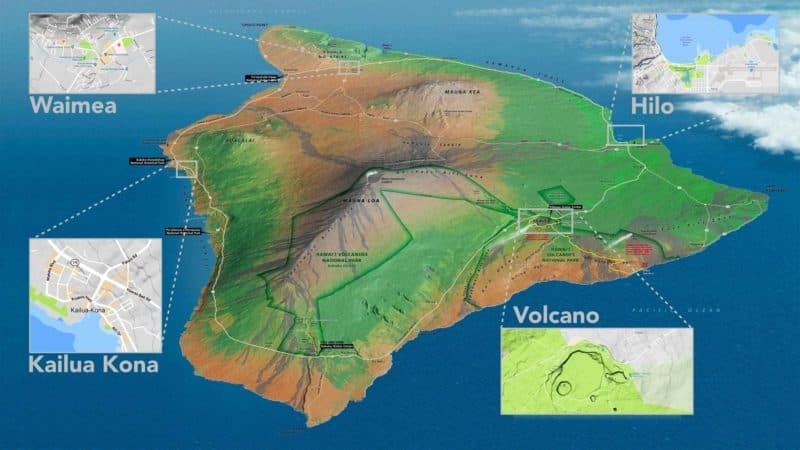 People that already know the Big Island will notice that we do not include the Waikoloa region in this map. Waikoloa lies on the border of our “Kona” and “Waimea” districts and is also known as the resort area of the Big Island. Waikoloa is a beautiful part of the Big Island, with great (dry and warm) weather, stunning beaches and breathtaking snorkeling spots. It is not a place that you should miss! You can find plenty of information about the good stuff (beaches!) on the Kona and Waimea sections of our website. Have a great time on the Big Island!